New York, NY (August 10, 2007) - The Directors of Marlborough Gallery are pleased to announce an eagerly anticipated exhibition of recent sculpture by Tom Otterness, one of the United States' premier public artists. 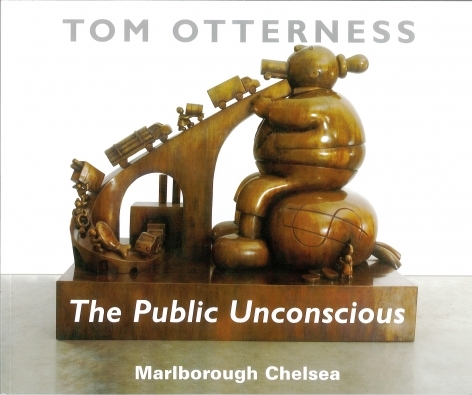 Tom Otterness: The Public Unconscious will inaugurate the spectacular first floor gallery of the new Marlborough Chelsea, located at 545 West 25th Street. The show consists of seven sculptures, including six of monumental proportions, and will be Otterness' first major gallery exhibition in five years. The exhibition opens on Thursday, October 4, 2007 and will continue through Saturday, November 3, 2007. “I'm delighted that Marlborough Chelsea will be opening with Tom Otterness' work,” said Levai. “Our first floor gallery was expressly designed to exhibit monumental sculpture such as Tom's.” A highlight of Tom Otterness: The Public Unconscious will be Large Immigrant Family, described by Otterness as the “emotional center of the show.” The sculpture, a ten-foot high, ten-foot long and nine-foot wide bronze, depicts a newly arrived family -- mother and father gazing attentively at their baby, who in turn looks outward to the world. This work encapsulates the immigrant experience, one to which many Americans can personally relate. 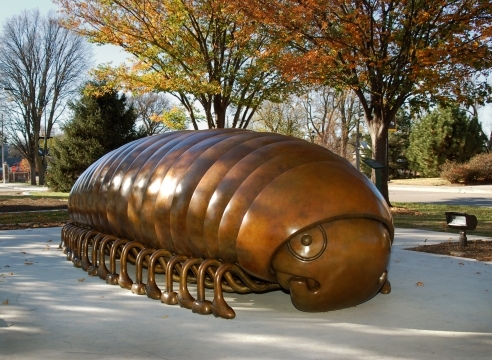 Otterness' sculpture is recognized for humorous and often satiric depictions of American society, especially those facets that many find uncomfortable to discuss: class, money, religion and sexual relations. Large Consumer, 2007, is a prime example of this focus in Otterness' work: a fantastical monumental bronze of a rotund giant man sitting on a moneybag, gobbling trucks and products as they ascend a huge ramp from a factory down below and into his mouth. An oil truck, generic delivery trucks, a woman pushing an oil barrel, a figure pushing a pack of cigarettes, a woman hauling an enormous diamond ring and a man pulling an oversize, dead fish compose this parade of rampant consumerism, while the belly of the man enlarges to the point of explosion. the MTA 14th Street A-C-E-L subway station in New York City, The Marriage of Real Estate and Money at New York City's Roosevelt Island, The Return of the Four-Leggeds at the Northwest Museum of Arts and Culture in Spokane, Washington, Time and Money in Times Square, Suspended Mind at the Montefiore Children's Hospital in the Bronx, Tornado of Ideas at Texas Tech University, Lubbock, Texas, and installations in Camuy, Puerto Rico and Indianapolis, Indiana. Installed along the North Sea near The Hague, The Netherlands, is Otterness' large-scale installation for the Beelden aan Zee Museum in Scheveningen. This project includes some of his largest bronzes to date, including, Harringeter (Herring Eater) which stands forty-five feet; creating a striking silhouette against the Dutch horizon. Otterness was the first contemporary artist to be invited to create a helium balloon, Humpty Dumpty, for the Macy's Thanksgiving Day Parade, seen by millions of television viewers worldwide. Otterness hails from Wichita, Kansas and has been a New York resident since the 1970s. He works from a studio in Gowanus, Brooklyn. This exhibition will run concurrently with Steven Charles: Thirteen Monsters for Lighting Bolt on the second floor of Marlborough Chelsea, 545 West 25th Street, New York, NY. An illustrated catalogue with an essay by Hilarie Sheets will be available at the time of the exhibition.